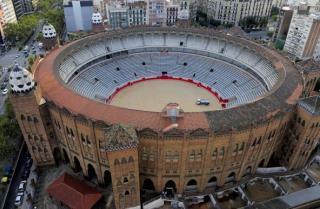 (Newser) – Today's bullfights at the 97-year-old Plaza de Toros Monumental arena in Barcelona will be the last ever for the venerable—and brutal—sport in Catalonia province, reports the BBC. The province voted to end bullfighting last year, the first ban on the corrida de toros in mainland Spain (it's been banned on the Canary Islands since 1991). "This is such a beautiful arena, with a lot of tradition both for bullfighters and this national celebration," said one matador. Thank you Barcelona! Cruelty to animals must stop. Maybe soon the USA will ban boxing. This seems to be about regional identity more than anything else. In Spain the Catalonians ban bullfighting to put some distance between themselves and Madrid; in France the Catalonians promote bullfighting to put distance between themselves and Paris.